The Orlando Pride needed a win and Marta delivered, scoring the game-winning goal in the 86th minute to give the Pride a 2-1 win over the Washington Spirit. The win puts the Prude at 7-5-4 with 25 points, good enough for third place in the NWSL once all was said and done in Week 15. The Spirit remain in eighth place at 2-10-4 with 10 points. The Pride were coming off two tough losses last week, a 2-1 late loss at home to the Dash before a 3-0 defeat at the hands of the Courage. Anything less than three points would’ve seen the Pride slip below the playoff line with the final third of the season remaining. With the score tied 1-1, Spirit defender Whitney Church tried to serve a Pride clearance back into the attacking third, but her pass was picked off by Pride forward Sydney Leroux. Leroux quickly passed it to Marta, making a run just over midfield. Marta charged down the left sideline and Church and Estelle Johnson raced back to defend as Marta dribbled into the box. Marta cut once to her right, and then quickly back to her left, before roofing a left-footed shot up and over Church and goalkeeper Aubrey Bledsoe to make it 2-1. It’s Marta’s third goal of the season and first in the run of play. She scored on a penalty kick in the season opener and then a free kick when she returned from international duty on April 28. Saturday night’s goal snapped an eight-game goalless drought for Marta, who now has 16 career NWSL goals since joining the league last season. Marta finished the game with 11 total shots, five shots on goal and eight chances created on 77 total touches. She also had an 85.7% passing accuracy on 42 pass attempts. “I told you before the game we need to take opportunities and score goals. I feel like today, I have more space, create opportunities,” Marta told Dalen Cuff on ESPNews after the game. Marta had her chances throughout the game, but Bledsoe was up to the task against her former teammate. Marta had four shots in just the game’s first 15 minutes, but Bledsoe came up big to stop her in the seventh minute. Ashley Hatch scored the first goal of the game, snapping a five-game goalless streak for the Spirit. She headed in a Church corner kick to give the Spirit the lead in the 26th minute. Leroux tied the game for the Pride just before the halftime whistle, taking a pass from Alanna Kennedy into the box, cutting around Church and then hitting it near post to beat Bledsoe. The goal is Leroux’s fifth of the season and she leads the Pride in scoring. Bledsoe made 10 total saves in the match, as the Pride dominated in shots 31-16 and shots on goal 12-5 until Marta finally found her breakthrough in the 86th minute. Both teams would’ve had more goals if not for the woodwork. On a well-placed corner kick from Marta, Kennedy’s header went off the crossbar in the 80th minute. In the 63rd minute, Estefanía Banini had a looping shot go off the post and the follow-up shot by Meggie Dougherty Howard stopped by Carson Pickett. Camila made her return to the field for the Pride, coming in as a sub in the 65th minute for her first game action since tearing her ACL in last year’s regular season finale. She took three shots in her 25 minutes. Her best chance came in the 68th minute. Chioma Ubogagu served a low pass into the box and in the direction of Marta, but Spirit midfielder Tori Huster just beat Marta to avoid another Marta shot on goal. Dani Weatherholt tapped the loose ball to Camila, but her shot went high. 68' | That would've been something if Camila scored on that hit! Rose Lavelle also entered as a sub, coming on in the 75th minute after missing the last few matches with left hamstring inflammation. Francisca Ordega left the game in the 10th minute after a collision in the box with Pride goalkeeper Ashlyn Harris. Dalen Cuff reported on ESPNews that Ordega was entered into concussion protocol. Alex Morgan missed the match with a right calf strain. She was listed as questionable coming into the match, but was not an available sub on Saturday night. Both teams are quickly back in action on Wednesday night. The Pride head to Houston for another meeting with the Dash. The Spirit will head to North Carolina to take on the first-place Courage. 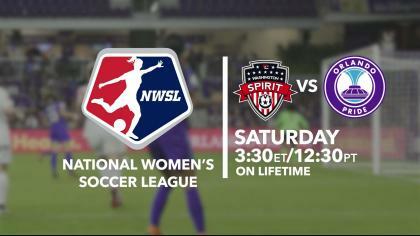 Match ends, Orlando Pride 2, Washington Spirit 1. Second Half ends, Orlando Pride 2, Washington Spirit 1. Attempt missed. Caprice Dydasco (Washington Spirit) left footed shot from the left side of the box is close, but misses the top right corner following a corner. Attempt blocked. Whitney Church (Washington Spirit) left footed shot from the centre of the box is blocked. Attempt blocked. Whitney Church (Washington Spirit) right footed shot from the centre of the box is blocked. Attempt missed. Aubrey Bledsoe (Washington Spirit) header from the centre of the box misses to the right. Assisted by Caprice Dydasco with a cross following a corner. Corner, Washington Spirit. Conceded by Mônica. Marta (Orlando Pride) is shown the yellow card for a bad foul. Corner, Washington Spirit. Conceded by Dani Weatherholt. Attempt blocked. Ashley Hatch (Washington Spirit) left footed shot from outside the box is blocked. Assisted by Tori Huster. Goal! Orlando Pride 2, Washington Spirit 1. Marta (Orlando Pride) left footed shot from the left side of the box to the top left corner. Assisted by Sydney Leroux. Attempt missed. 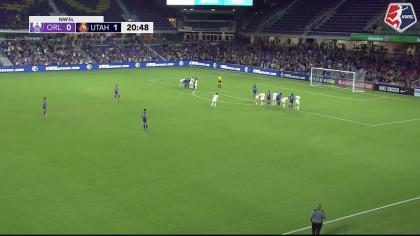 Alanna Kennedy (Orlando Pride) header from the centre of the box is close, but misses to the right. Assisted by Marta with a cross following a corner. Corner, Orlando Pride. Conceded by Taylor Smith. Attempt blocked. Camila (Orlando Pride) right footed shot from outside the box is blocked. Assisted by Sydney Leroux. Attempt missed. Camila (Orlando Pride) right footed shot from outside the box is close, but misses to the left. Assisted by Marta. Alanna Kennedy (Orlando Pride) hits the bar with a header from the centre of the box. Assisted by Marta with a cross following a corner. Corner, Orlando Pride. Conceded by Aubrey Bledsoe. Attempt saved. Sydney Leroux (Orlando Pride) left footed shot from the centre of the box is saved in the bottom left corner. Assisted by Dani Weatherholt. Substitution, Orlando Pride. Rachel Hill replaces Chioma Ubogagu. Attempt missed. Sydney Leroux (Orlando Pride) left footed shot from the centre of the box misses to the left. Attempt missed. Camila (Orlando Pride) right footed shot from outside the box is too high. Assisted by Dani Weatherholt. Attempt blocked. Marta (Orlando Pride) left footed shot from the centre of the box is blocked. Assisted by Chioma Ubogagu. Substitution, Orlando Pride. Dani Weatherholt replaces Christine Nairn. Substitution, Orlando Pride. Camila replaces Emily van Egmond. Attempt blocked. Meggie Dougherty Howard (Washington Spirit) left footed shot from the centre of the box is blocked. 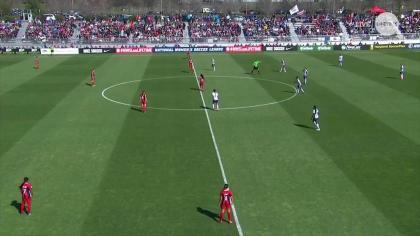 Estefanía Banini (Washington Spirit) hits the right post with a right footed shot from the left side of the box. Attempt saved. Ashley Hatch (Washington Spirit) right footed shot from the centre of the box is saved in the bottom left corner. Assisted by Andi Sullivan. Attempt saved. Mônica (Orlando Pride) left footed shot from the left side of the box is saved in the centre of the goal. Assisted by Chioma Ubogagu. Attempt blocked. Sydney Leroux (Orlando Pride) right footed shot from the left side of the box is blocked. Assisted by Emily van Egmond. Attempt saved. Marta (Orlando Pride) right footed shot from the right side of the box is saved in the bottom left corner. Attempt saved. Marta (Orlando Pride) left footed shot from outside the box is saved in the centre of the goal. Assisted by Emily van Egmond. Attempt saved. Marta (Orlando Pride) left footed shot from outside the box is saved in the centre of the goal. Sydney Leroux (Orlando Pride) wins a free kick in the attacking half. Attempt blocked. Marta (Orlando Pride) left footed shot from outside the box is blocked. Assisted by Emily van Egmond. Attempt blocked. Sydney Leroux (Orlando Pride) right footed shot from outside the box is blocked. Assisted by Marta. Attempt missed. Emily van Egmond (Orlando Pride) right footed shot from outside the box is too high. Offside, Orlando Pride. Christine Nairn tries a through ball, but Chioma Ubogagu is caught offside. Second Half begins Orlando Pride 1, Washington Spirit 1. First Half ends, Orlando Pride 1, Washington Spirit 1. Goal! Orlando Pride 1, Washington Spirit 1. Sydney Leroux (Orlando Pride) right footed shot from the left side of the box to the bottom left corner. Assisted by Alanna Kennedy. Attempt missed. Meggie Dougherty Howard (Washington Spirit) left footed shot from outside the box is close, but misses to the right. Assisted by Ashley Hatch. Attempt saved. Tori Huster (Washington Spirit) header from the centre of the box is saved in the bottom left corner. Assisted by Andi Sullivan. Corner, Orlando Pride. Conceded by Estefanía Banini. Attempt blocked. Ali Krieger (Orlando Pride) header from the left side of the six yard box is blocked. Assisted by Marta with a cross. Attempt blocked. Sydney Leroux (Orlando Pride) right footed shot from the right side of the box is blocked. Assisted by Ali Krieger. Attempt missed. Ali Krieger (Orlando Pride) right footed shot from very close range is too high. Assisted by Marta with a cross following a corner. Attempt saved. Chioma Ubogagu (Orlando Pride) left footed shot from the centre of the box is saved in the top centre of the goal. Assisted by Marta. Goal! Orlando Pride 0, Washington Spirit 1. Ashley Hatch (Washington Spirit) header from the centre of the box to the bottom left corner. Assisted by Whitney Church with a cross following a corner. Attempt blocked. Ashley Hatch (Washington Spirit) left footed shot from outside the box is blocked. Assisted by Taylor Smith. Attempt saved. Ashley Hatch (Washington Spirit) right footed shot from outside the box is saved in the bottom left corner. Attempt missed. Estefanía Banini (Washington Spirit) right footed shot from outside the box is just a bit too high. Assisted by Meggie Dougherty Howard. Attempt missed. Marta (Orlando Pride) left footed shot from outside the box misses to the left. Assisted by Alanna Kennedy with a headed pass. Attempt missed. Marta (Orlando Pride) header from the centre of the box misses to the right. Assisted by Carson Pickett. Attempt saved. Chioma Ubogagu (Orlando Pride) left footed shot from the left side of the box is saved in the bottom left corner. Assisted by Sydney Leroux. Attempt missed. Marta (Orlando Pride) right footed shot from very close range misses to the right. Assisted by Chioma Ubogagu with a cross. Attempt saved. Marta (Orlando Pride) left footed shot from the centre of the box is saved in the centre of the goal. Assisted by Ali Krieger. Attempt saved. Andi Sullivan (Washington Spirit) right footed shot from outside the box is saved in the bottom right corner. Assisted by Taylor Smith. Attempt missed. Sydney Leroux (Orlando Pride) right footed shot from the right side of the box is too high. Assisted by Carson Pickett. Delay in match Francisca Ordega (Washington Spirit) because of an injury. Attempt saved. Sydney Leroux (Orlando Pride) left footed shot from the centre of the box is saved in the bottom left corner. Assisted by Marta with a cross.